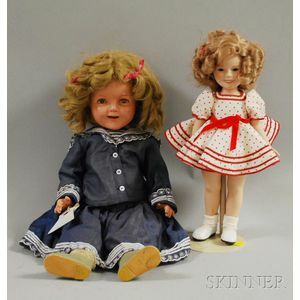 Ideal Shirley Temple Composition Doll and Bisque Shirley Doll, composition doll marked head and body Shirley Temple, ht. 22; bisque doll swivels at waist, long bisque legs, ht. 13 in. Eyes of composition doll are crazed, light crazing to face.